Saint William of Rochester, also known as Saint William of Perth was born in Perth, a very well known town in Scotland at the time. He was a wild, and mischievous child but, as he grew he devoted himself to God and to the service of God. Some accounts say he was a fisherman, others say he was a baker who set aside every tenth loaf of bread for the poor. By either account he was a kind and generous man of God. He was known to attend mass each and every day. One very early morning. while it was still quite dark outside, he found an abandoned child in the threshold of the church. Saint William adopted this child and taught him his trade and all that he knew. He named him “Cockermay Doucri,” which is Scots for “David the Foundling.” They took a vow and travelled to visit the Holy places together. They stopped at Rochester and stayed there for three days. They were planning on heading to Canterbury, and then possibly on to Jerusalem. It was then that events took a very sad turn. David, betraying his adopted father purposely misled William to take a short cut. David planned on robbing William and in the midst of the robbery he violently hit him over the head, and slit his throat. Saint William was dead, at the hand of his adopted son, to whom he had taught everything he knew. Soon after William’s death, David had disappeared and left his body in the very spot he had murdered him for his money. William’s body was discovered by a woman who was known to many as being one stricken with madness. She collected honeysuckle and made a garland of it, first placing it on William’s head, then on her own. It it said that from this very moment her madness left her and she became free of her burden. When the monks learned of her tale, they carried the body of William to Rochester and buried him at the cathedral. They honored him as a martyr because he died while on a noble and holy journey. 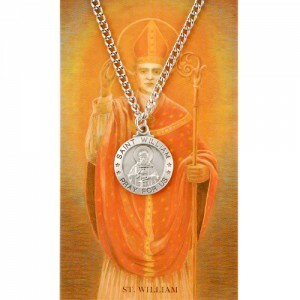 The people acclaimed William as a saint because of the miracle of the mad woman. While some might look at Saint William’s story and see it as a cautionary tale to trust no one, it is actually quite the opposite. William took David under his wing and taught him well. He gave him a loving home, holy and practical training, and every tool to a successful happy life. As parents, we must all teach our children well and give them these tools. The only hope for mankind to stay on a path of God is through the future generations. We must also accept though, that no matter how good we are to our children, and how well they are taught, some still stray from God. It is our duty to give them the love and the tools, but it is up to them to maintain a relationship with God. David was tempted by evil and greed. He killed his father and with that sin his father became a martyr and a saint. In death William helped a madwoman shed her burden and he performed miracles that helped many. William did what was right, and though it cost him his life, in death he became a saint. He remains with God in Heaven. It was uncommon for political people in history to stand up against the majority. There were many persecutors and the risk of death was too great. Saint Wenceslaus knew this but it didn’t keep him from infusing Christianity into the government of Bohemia. Saint Wenceslaus was the son of the Duke of Bohemia. His grandmother, Ludmilla, raised him as a Christian, despite his mother’s anti-Christian beliefs. Sadly, grandmother Ludmilla was later killed because of her Christian beliefs. Most would think that Saint Wenceslaus would not be able to succeed his father’s role in the Bohemia government, but that was not what happened. Christian rivals made it possible for Wenceslaus to become the ruler of Bohemia. In his ruling, he supported the Church. He also met with Germany to begin peace negotiations. This infuriated anti-Christians. His brother was anti-Christian like his mom. One day, his brother Boleslav invited Wenceslaus to the celebration of St. Cosmas and Damian. When Wenceslaus was on his way to Mass, his brother attacked him. In their struggle, Wenceslaus was killed by his brother’s supporters. Upon his death, Christians proclaimed him as a martyr for his faith despite opposition. He was buried and his grave is a shrine now. He is known as the patron or Saint of Bohemia. Most politicians do not factor in God’s teachings in how they run the government. When they do, they usually meet opposition from anti-Christians, just as in the case of St. Wenceslaus. What must be remembered about St. Wenceslaus is that he didn’t let that stand in his way. He knew there was a chance he would be killed for his beliefs, just as his grandmother was, but he didn’t let his faith falter. 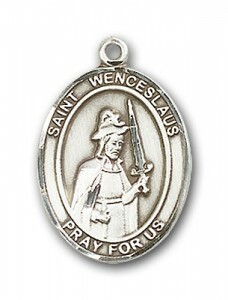 Many of us would live much closer to God if we adopted the faith St. Wenceslaus had. Many of us fear that if we stand against others, we will be punished by them. However, what happens when we stand up against God? Well, we end up turning away from Him. God has put us on Earth to help him not to go against Him. Being true to God means delivering the message He wants passed on to Earth. Try to get involved in community activities to do good according to God. You can be of great influence to the community if you just take the time to deliver God’s message. Do things that please God. Helping the poor, encouraging peace, and helping others do the same can deliver God’s message in a way that helps people see your beliefs are for good, not for corruption. By taking an active role in your community, or local government, you can bring God closer to you and many others. If you do your part in delivering God’s message, and others do the same, our communities and life will continue to receive God’s good graces. Nowadays, there is a somewhat hazy division between the government and church. While some of the decisions of the government affect the church, not all of the decisions the government makes is affected by the church. Back in the 4th century, this was not the case. The government and church were intertwined. The ruler of the government religious beliefs were what framed the entire area that government ruled. This is how St. Ambrose influenced Milan with the Catholic Church’s teachings. St. Ambrose was born somewhere in between 337 and 340, and he was raised in Trier. His father was a huge political figure, but he died at an early age. St. Ambrose went to school in Rome to learn literature, law and rhetoric. He started his political career as a council member, and quickly became counsular prefect. Counsular prefect was another name for Governor. He was Governor of Liguria and Emilia. This political status led him to be recommended for Bishop of Milan. St. Ambrose did not want to take this offer because he felt he was not right for it since he was not baptized. St. Ambrose hid from the emperor of the time, Emperor Gratian. He hid in a home, but the host uncovered him when a letter was sent from Emperor Gratian commending him of all he had done. After about a week, St. Ambrose was baptized, ordained, and became bishop of Milan. Unfortunately, he became bishop during a very frightening time in the diocese of Milan. There was a great conflict between Catholics and Arians. He is known to have calmed down the conflict arising from the Arians, and integrating Catholicism into the area much more than it was. He also is known for being highly generous to the poor. He gave all of his money to the poor, and gave up all of his land. His sister, Marcellina was also religious and became a nun. He would care for her also with the money he made. Due to St. Ambrose’s education and influence, he was named as a Doctor of the Church. This is quite an honor because it signifies his great contribution to the church in its formation. Saint Ambrose wanted peace in the land. 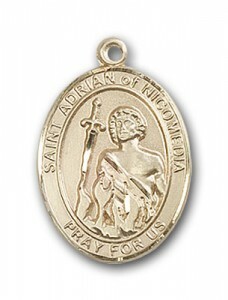 While he did not reject Arians, he did want to calm the conflict between them and Catholics, which is what he did. In that, he was able to show Arians the power of God, and what He can do for them. Through his example of generousity, St. Ambrose taught many people the importance of what it means to give to the poor. When we give to the poor, we do what God does all the time – we provide them comfort. Many people become poor not because of their own doing, but because of poor situations. It’s just like someone becoming ill. We should help them, and make their life less of a struggle because that is what God wants for them. Even if people become poor because their own doing, it’s important to know that God forgives, and helps people get back on their feet. You can do God’s work by helping them.